Some say that Hollywood hasn’t had an original idea in ages. Remakes, re-boots, and “re-imaginings” are everywhere, mostly because those with the money have become the ones making the creative decisions. Ideas with any “name recognition” are considered (by bean-counters, at least) vastly superior to more original scenarios, only because those bean-counters (and therefore the audience they think they’re serving) can get a very quick handle upon what is being presented. The audience is familiar with it, after all. But sometimes, the idea of a remake isn’t a bad thing. Especially when the guy with the original idea is involved from the beginning. And, if done properly, the remake can get rid of some of the problems the prior incarnation may have had, like a limited budget, slower pace, and the occasionally wobbly set or two. Dark Shadows was a gothic soap opera on ABC, running on weekday afternoons from 1966 to 1971. Creator Dan Curtis (who also brought Kolchak: The Night Stalker to television) believed that, with a bit of tweaking, the Dark Shadows scenario was ready-made for a more modern prime-time audience. NBC agreed, and an initial order for 13 hours was made… and although the storyline was familiar, it certainly wasn’t the original 13 episodes of the original show. Dark Shadows concerns the Collins family, whose ancestors were founders of the town of Collinsport, Maine back in the early days of America. Their family history runs extremely deep (along with their family secrets), and the new governess, Victoria Winters (Joanna Going), starts to uncover truths that most would prefer to remain hidden. She is introduced to the family matriarch, Elizabeth Collins Stoddard (Jean Simmons), and to the rest of the rather strange clan living at ancient Collinwood Manor. These include Elizabeth’s daughter Carolyn Stoddard (Barbara Blackburn); and Elizabeth’s brother Richard (Roy Thinnes) and his young son David (Joseph Gordon-Levitt), whom Victoria has been brought in to tutor and care for. Another Collins soon arrives on the scene. Barnabas Collins (Ben Cross) claims to be a long-lost relative, descended from his ancestor namesake who led the family back in colonial days. This is confirmed by the painting of the original Barnabas, who looks strikingly similar. In true gothic horror tradition, however, there’s only one Barnabas. He is a vampire, eternally undead, who was chained up and sealed in the Collins mausoleum to protect the town all those years ago. Now accidentally set free by the Collins family groundskeeper, Willie Loomis (Jim Fyfe), Barnabas has revived and is ready to take his rightful place again… and perhaps the heart of Victoria Winters as well. There’s a large and involved web of relationships between the Collins family and the locals. Daphne Collins (Rebecca Staab), niece to Elizabeth, is unfortunately attacked by the newly revived Barnabas, and is ultimately killed by the authorities after becoming a vampire herself. Her boyfriend Joe Haskell (Michael T. Weiss) pursues vengeance against Barnabas. The attack on Daphne is also investigated by Dr. Julia Hoffman (Barbara Steele), who figures out Barnabas’ secret, and ultimately convinces Barnabas that only she can create a cure for his curse. The curse is, obviously, part of those old family secrets, when Barnabas was seduced by Angelique Bouchard (Lysette Anthony), the maidservant of the woman he was set to marry back in 1790. Enraged when Barnabas rejects her, Angelique uses the powers of dark magic to curse Barnabas with vampirism. She punishes him further by dooming all he loves to an early death, an anguish which he must continually experience throughout his unending existence. There are other residents of Collinwood, both helpful and suspicious of the Collins family and their secrets. The series concerned the ever-changing nature and allegiance of the characters relationships, like on many soap operas, with a few good scares thrown in. But, as stated earlier, this wasn’t the original Dark Shadows soap opera. First, audiences had changed significantly from the late ’60’s. The style and pace of television presentation was much faster in 1991, especially when compared to the almost glacial speed of the original daily half-hour afternoon serial. Therefore, if there was to be an updated version, rewrites were mandatory. Original creator Dan Curtis and his production team went to work. The new version would take the arrival of Victoria as its beginning, just as the ABC soap opera did. But the original series ran for a season before the arrival of Barnabas Collins, who shows up about 15 minutes into the first episode of the revival. After that, each episode of the 1991 series encompasses about a month (or two) of the main storylines from 25 years earlier. Six episodes of the new series used up the main daytime soap opera plot for almost a year. In 1967, Dark Shadows bent the rules even more, as the gothic soap introduced a time-travel storyline. 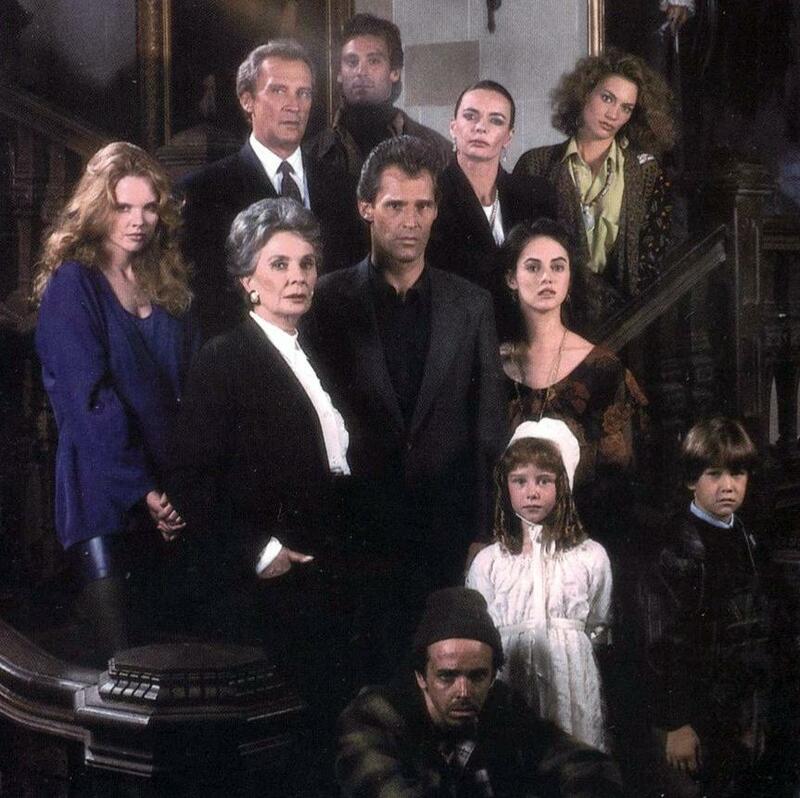 The 1991 revival followed suit, when Victoria (who by now had become a love interest of Barnabas, even though she knew nothing of his curse) was convinced to participate in a séance. When the lights go out, she is somehow transported back to the year 1790, caught up in the interactions of the original inhabitants of Collinsport, and the origin of their secrets. These new characters (except for Barnabas, of course, who was still the same long-lived individual) were played by actors from the modern-day storyline, in new, dual roles. We see the doomed love of Barnabas, the original seduction with Angelique, and others of the early Collins clan, as Victoria tries to save Barnabas from his fate… at the risk of trapping her in the past forever, or even dying in his lover’s place. This time-bending storyline took the better part of another year on the original series, yet in the 1991 revival it took only another six episodes to play out. 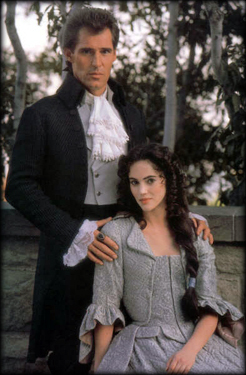 Unlike the beginning of the revival, however, small but significant changes were made to the soap opera storyline (again, “re-writes”), and it was hoped that these changes would slowly move the new adaptation of the show away from slavish devotion to the original. Besides, at six or so episodes equaling a year of previous plot, new storylines were going to be necessary all too soon. Of course, that was only true if the show were to continue. While the late winter run had debuted to tremendous ratings, the beginnings of the Gulf War shortly derailed any momentum built up by the show. NBC constantly pre-empted and delayed the series for news reports and specials, and even audiences who actively wanted to watch the show were frustrated by uncertainty over finding it. Ratings suffered, and ultimately Dark Shadows was canceled again, as it had been decades earlier. What witchcraft is this? To cancel our show? 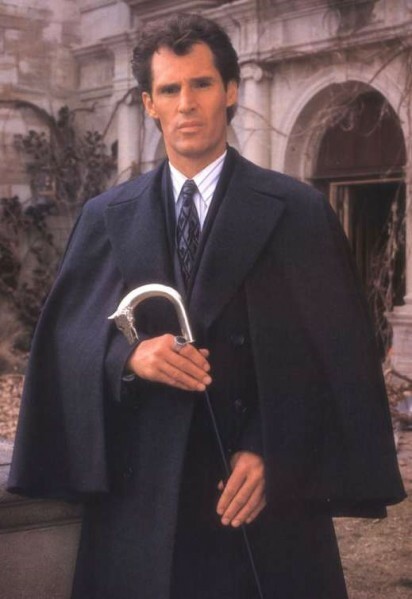 BEN CROSS (Barnabas Collins) was one of the starring actors in the Oscar-winning Best Picture Chariots of Fire, kicking off a terrific career. He’s been seen as everything from a medieval prince (First Knight) to Captain Nemo (20,000 Leagues Under the Sea) to biblical hero Solomon (Solomon) to Spock’s father Sarek in the most recent Star Trek movie. He’s also an accomplished musician and composer, with multiple musicals to his credit. JOANNA GOING (Victoria Winters) also made the jump from soap operas to Dark Shadows, having appeared previously in both Search for Tomorrow and Another World. She starred in the series Going to Extremes, as well as playing recurring roles on Spin City and Close to Home. Most recently, she played Sean Penn’s wife in the award-winning independent film The Tree of Life. JEAN SIMMONS (Elizabeth Collins Stoddard) came to prominence in the ’40’s and ’50’s, both in her native Britain and in America. Best known here for her starring turn in Guys and Dolls and television miniseries roles in North and South and The Thorn Birds, she was nominated for two Oscars (twenty-one years apart!) She passed away of lung cancer in January of 2010. BARBARA BLACKBURN (Carolyn Stoddard) also had a soap opera background, featured on Ryan’s Hope prior to Dark Shadows. A few small TV spots followed, including Law and Order and Close to Home, before she left the business in 1995. ROY THINNES (Richard Collins) was a genre favorite, chased by aliens in the seminal ’60’s series The Invaders (also was re-booted into a miniseries years later, in which Thinnes made a cameo). He was also featured on television in The Psychiatrist, From Here to Eternity, and Falcon Crest. A guest spot on The X-Files became a return visit when his character was so well liked, he recreated the part in other episodes. JOSEPH GORDON-LEVITT (David Collins) played a brat child on Dark Shadows, but played a wiser-than-his-years (alien) teen-ager in Third Rock From the Sun. He’s become a feature film actor and leading man, in (500) Days of Summer, Inception, and next year’s Batman feature The Dark Knight Rises. JIM FYFE (Willie Loomis) was part of Tanner ’88, a spoof of election campaigns, and sixteen years later reprised that role in Tanner on Tanner. In between, he was seen in Team Knight Rider, Once and Again, and in both The X-Files and its spin-off, The Lone Gunmen. He also hosted two HBO specials for kids, helping them make environmentally conscious choices. REBECCA STAAB (Daphne Collins) started in the soaps Guiding Light and Loving, before making the jump to prime-time. She’s guested on numerous series, including Cheers, The Wonder Years, and The Mentalist. A former Miss Nebraska and finalist for Miss USA, she is an avid outdoor sportswoman, comparing her garage to miniature “sports chalet”. MICHAEL T. WEISS (Joe Haskell) started on Days of Our Lives, logging over 500 episodes on the series. He’s well-known for his lead role in the TV series The Pretender, and most recently has been a part of the current CBS series Blue Bloods. BARBARA STEELE (Dr. Julia Hoffman) had a long career in British film, dating back to being an extra in Alfred Hitchcock’s The 39 Steps. A part in Fellini’s masterpiece 8½ followed. Many horror and thriller features later (including The Pit and the Pendulum with Vincent Price), she found she was becoming typecast and retired from acting for a decade. Barbara became a producer, winning an Emmy award for the mini-series War and Remembrance. She then joined Dark Shadows, delighting fans of her horror work. LYSETTE ANTHONY (Angelique Bouchard) has spent most of her career in her native Britain (Dark Shadows was her only American series). A regular in Cluedo (the British term for the boardgame “Clue” in America), she played Miss Scarlet. Other appearances included Night & Day, The Bill, Hollyoaks, Casuality, and Coronation Street. She’s reprised her role as Angelique in the Big Finish audio dramas for Dark Shadows. The revival series has received a DVD release, although it is sadly devoid of extras. Those suffering from more immediate blood lust can find the episodes on Hulu.com. The original soap opera has also been released (at least, the majority of episodes, as some simply no longer exist). There are various fan sites out there dedicated to both incarnations, and featuring detailed storyline information allowing for the comparison of the two series. Another “re-imagining” of Dark Shadows was done as a pilot for The WB in 2004, but never made it to television (although screenings have been held at various Dark Shadows fan events since). Big Finish audio in Britain has started a set of audio adventures furthering the storylines once again and featuring the talents of many of the actors from both series. Remakes and updates abound for all sorts of shows. The revival of Hawaii Five-O is starting its second season this fall on CBS, ABC has a new version of Charlie’s Angels, and a pilot script has been ordered for another try at the comedy Bewitched. Dark Shadows is, by no means, alone in this respect, but it is unique for retaining much of its original storyline instead of just a concept and characters. But that’s likely because the story of Collinwood and Barnabas Collins was part of a continuing narrative (due to its soap origins), and the presentation already contained many of the elements that make a story interesting. It’s really no wonder people keep coming back to it. Therefore, it’s no surprise there is work going on for an updated movie version of Dark Shadows, directed by Tim Burton, and featuring Johnny Depp as Barnabas. The new film is scheduled for a big May opening in 2012, and a full advertising and merchandising push. Other stars involved include Helena Bohnam Carter, Michelle Pfeiffer, and Jackie Earle Haley. Although it re-arranges the story so there is no longer a time-travel element (the action is seen in chronological order), both the 1790 storyline and the more modern plot are parts of the movie, and anticipation is growing…. …as well it should. Dark Shadows is a great concept, one which almost defines gothic horror for multiple generations. It is only fitting and appropriate for Barnabas Collins to return from his coffin once more to live among the residents of Collinwood Manor, to fill us with chills and forbidden romance, to give the world a good, comfortable fright. Because that’s what a vampire is supposed to do, right? Death is for the mortal… eternal life remains in the Dark Shadows. Aired at Friday 8/7 Central? Later in the evening (although still on Fridays), befitting it’s more scary and sexualized nature. But then, NBC didn’t tell many people when they were going to pre-empt it for war coverage anyway, so some weeks it aired at 9pm; some at 10; and sometimes just delayed and delayed again. I remember watching reruns of the original off of the Sci-Fi channel, it was fun in its own way. Lol, to your descript of its ‘glacial speed’ – we’d sometimes wait a week and watch all six eps in a row just so we wouldn’t have as many cliffhangers and so that more of the story could progress at a sitting! It was weird to see the new version came on and how they shaped it into a night time soap and reduced the story to that many fewer eps. Of course now the Burton/Depp movie is gonna have to squeeze it down to just a 2 or so hour movie length. That’ll be fun to see. Coincidentally, I had just seen Ben Cross in a bit of Species the morning before reading your article, so his face was in my mind. Small world this world of Television. I really liked the original series, as cheesy as it was, and consequently had to see this one too. I thought it had its own merits, and therefore deserves to exist. I loved both the original and the Revival series. I did not like the new movie though. Too cartoonish for me and the script wasn’t good.